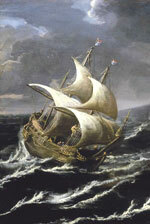 In 2000, the British research ship Discovery was caught in a fearsome storm. As the battered vessel struggled into the dock, scientists discovered that the ship’s research devices were working. The data confirmed waves more than 60 feet high. Scientists had earlier scoffed at seafarers’ stories about rogue waves: their models could not confirm waves higher than 60 feet. Discovery’s reports, then the tsunami and the knowledge that waves are critical to understand climate change combined to make a scarcely researched subject hip.